Z and I were sitting there yesterday morning (let's say morning because otherwise our summer laziness will be exposed), eating our cereal, when I suddenly realized that it was July and I needed to look up what date our blogiversary was so that I didn't miss it. For some reason, I can never remember it. Well, it turns out that it's TODAY, July 8th. I never knew what the blog would blossom into. Six years ago, I had a four-year-old preschooler who was needing less of my attention and I was finally able to start reading again during the previous months. I wasn't super familiar with anything but personal blogs (which I wasn't very interested in writing) but thought that I could probably write something about the books I was reading. I scoped out the existing book blogger community, pondered using an alias (no for me, yes for Z), came up with a catchy name (assonance, ftw), and decided to try it out for a year or so. At the time, I had a TBR stack of probably about 15-20 books. Six years later, this is my 1204th post (in 2192 days). I've received 6231 comments. I've posted more of my photographs than I care to count. I've given away 24 books (on my own, with a couple of publisher-supported giveaways on top of that), 5 gift cards, and a necklace. I've participated in 8 read-a-thons, a couple of book/letter swaps, and lots of challenges (including 5 years so far of my favorite R.I.P. Challenge). 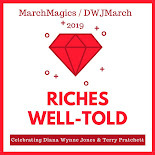 I've also hosted three years of Diana Wynne Jones March and written about chapter books for almost two years on The Estella Society. And I now have a TBR of almost 200 books. I'm not kidding about being lucky. Thank you all for your love of books, for sharing your favorites with me and for letting me share mine with you. Yep, I pulled out the Neil picture again. Finally, I want to remember how lucky I've been to meet some of my favorite authors -- Neil Gaiman, Carlos Ruiz Zafón, Catherynne M. Valente, Ransom Riggs. Did I mention meeting Neil? I'm not sure if I did. What am I hoping for the year ahead? I would love to get a chance to meet more bloggers, especially if I do actually make it to the UK as planned. I would love to meet more authors (fingers crossed for a Jasper Fforde Seattle visit because I've always been too nervous to go meet him). And, well, I would like to read more books and share them with all of you. How does that sound? congratulations, that's a big one! Thank you! I honestly never thought I would do this for so long. Happy happy bloggiversary Kristen! So glad to have "met" you through blogging. I love seeing how blogging went from just a simple little hobby for you to something so much bigger. It's times like these when I have such an adoration for blogging. LOL! To many more! Congratulations on six years! I'm so glad that blogging 'introduced' us to each other. And that we're both still reading. What a great obsession, eh?! Happy bloggiversary! Six years - wow! And I loved reading about all that you've done since you first started. Thank you! It was fun looking all of that stuff up. I'm hoping to go next spring for my ::ahem 40th:: birthday. It would be the best present ever! As an aside, I'm trying to make a conscious decision on cutting back for a while on how much time I spend on reading/commenting on blogs I love and follow, 'cause if I don't, my own blogs will never be launched *sigh* I'm not disappearing...just fading for a bit with occasional apparitional appearances. I figure if I actually TELL everyone I'm doing this (that is, if you notice lol)---I actually WILL! Good luck on spending your time writing! Woo hoo!! Congratulations!!! Andi and I have been so lucky to have you at The Estella Society. Here's hoping for many, many more years! Congratulations on six years! It hardly feels like that long--my own six years have flown by, yet it's hard to imagine life without blogging. Thank you! It has definitely flown by. I had to double-check the year because I couldn't quite believe it. Congratulations!~ 6 years takes dedication. Thank you, my dear. You are the best! Six years and 1204 posts. That's amazing! I've been blogging for almost eleven months, and I'm surprised at how much I enjoy it. Congratulations.